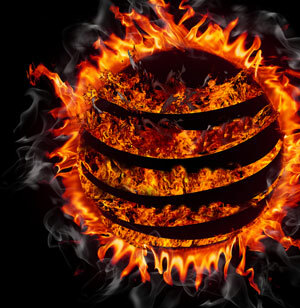 If There Is A Hell, AT&T Has The Telecommunications Contract. Out of all the people in all the gin joints in the world, At&T decided we were worthy of their demonstration of total ineptitude. Some of you may remember our run in with the folks at AT&T. Over the past couple of months, we have written about how AT&T said we didn’t exist as a customer, how you cannot communicate with them via an email (because they don’t want you to have a record of what they say,) and how a “free” upgrade in speed for our internet service was actually billed to us. For awhile there, we prayed that God would grant us the leeway to not have to talk to the people at AT&T again – at least for awhile. But God has a sense of humor (ever see a platypus?) and so our tale of woe with AT&T continues. Last week we noticed the speed of our internet connection dropped. We had caught the same cold that other people had so we didn’t get to look at it too much but on this past Tuesday, we started to take a good hard look at what was happening. We tore apart our computer looking for viruses and other malware items. Nothing. We made sure all of the services running we legitimate and identical to ones supplied by Microsoft. That checked out. We ran scans for root kits. Nothing. We couldn’t figure it out. There was something throttling the internet speed and we couldn’t find it. We checked ping responses to measure internet speed and sure enough, we were way down on speed. We then installed a simple little speed monitor and that verified we were way down on speed as well. Still not feeling well and running out of options, we decided to put the issue away for a little bit hoping that something would come to mind. We took up the task of paying bills. When we got to our AT&T bill, we looked at it and noticed it was lower than expected. Specifically, the price for internet was lower. We looked at the service we were paying for and not only was it not the right service – the one that AT&T promised we would get for a year, it was actually a service level below that for which we had over the last 5 years. Someone, somehow had bumped us down two levels of speed from AT&T. “You must have,” they said. Our last contact with AT&T was on November 11, 2012. So either someone had made an unauthorized change, or they would have to say that an order that we placed on November 11 took 12 days to complete. “Well, it must have been you, sir,” the agent said. “What is the order number?” we asked. “Errrrrr…. there doesn’t seem to be any,” she replied. “But you must have ordered it. Second thing of which we are convinced: to AT&T, it is always the customer’s fault. For two hours we talked to 8 people, all of whom said we must have done something even though their screens and information was showing otherwise. Agents, supervisors, and supervisors of supervisors all said the same thing. It must have been our fault. Third thing of note: agents are taught to say “we’re sorry you are going through this and I can help you with that.” They aren’t sorry one bit. That is a tactic to try and calm the customer through some sort of “empathy” with you when in fact you are simply a number to them that they don’t give a rat’s patootie about. Yeah, they are sorry, but they aren’t sorry for what they do. Here’s why we say that. In the end, it was discovered that when we complained about being charged for the “free internet speed increase,” the guy who “fixed it” had entered the wrong billing code. Instead of fixing what was wrong, he entered a code for a promotion that was going to begin a few weeks after we talked to him on November 11. So despite claiming we must have done something, it was their mistake. One would think that after all this we would get an apology from AT&T. If you ever find a consumer-advocate or ombudsman at ATT, please post it for us others. I have been searching for info on AT&T for some time. I know there is one site that has a list of CEO’s and contacts but I can’t find AT&T on the site. I wrote a letter to AT&T Customer Service in November and have yet to hear anything from them. I am not holding my breath. If I get anything, I’ll make sure to post it and send it to you personally. Here is the top corporate person and this link might lead you to others. The address given by Wiki is where I sent my letter. No response from them yet, but thanks for the info!